Among the European Union’s Germany is the most popular country with 82 million people living in German territory. Germany is the first country to introduce the “immigrating law” and widely recognized as the first immigration country. This country is well known for its research and innovation. With its strong industrial foundation, products, services and technologies they are meeting the challenges of global competition in order to create stable and feasible jobs for the overseas workers. This country is also the possible choice for the international students. Working in Germany: Are you interested working in Germany? The new implementations the European Union’s Directive on Highly Qualified Workers (Blue card) made Germany immigration process easier for the qualified workers from the foreign states. This new EU Blue card also introduces a new residence permit in order to attract the foreign workers from abroad in to the country for the long-term outlook for the country. They also have improved the juridical guidelines in respect to the employment of the foreign students of German universities. This country made some changes to the immigration procedures and introduced new categories like ‘highly skilled professional’ and ‘scientist’ in order to attract and introduce the admirable experts into the German labour market. The immigration process for the non-EU citizen as a skilled worker is more flexible as they have introduced 3 types of immigration titles such as temporary residence permits, settlement permits, work permits. These visas are available for the foreigners, but not independently are included within the immigration title. All these are categories and requirements are listed in the law of employment. Under the immigration process, there are two types of visas, Business visa and student visa. Business visa: This visa is issued for business people like managing directors, teachers, sportsmen etc. and is valid up to only 90 days within every 6 months. The important factor is work must not be performed on the basis of the business visa. Student visa: under this student visa an extension can be made up to six months and the former can apply for the visa when the admission to the university is not yet completed or before the last three months after the visa is granted they can apply for the an extended residence permit this is for those who wanted to stay longer than 90 days. One more plus point for the foreign students is the public German universities do not charge tuition fees. 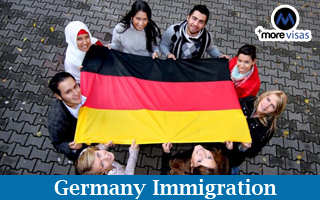 Thus, the immigration process for Germany is made very easier for the skilled workers and students from abroad those who are willing to study and work in Germany. If you are interested to migrate, fill out our Enquiry Form, so we will approach you to assist. And for more immigration updates follow us at Facebook, Google+ and LinkedIn.